A few weeks ago, the open data community received a bit of a shock, in the form of a sharp, well-argued critique by Evgeny Mozorov. He claims that the “open government” meme hides a disconnect between those of us who interpret openness as transparency, accountability and ultimately human rights; and those that interpret it as contendibility to market competition, efficiency and GDP generation. In the extreme, he argues, “open government” can be made to mean “government open to competition from the private sector for the management of public goods”. I agree with Mozorov that the difference in approach is there. However, I propose a point of view to reconcile the two different outlooks in practice. To do this, I borrow the words of the Italian blogger Michele Vianello, whom Mozorov would place firmly in the “openness for growth” camp. Michele is unconvinced by the sort of data that the Italian open data movement advocates the opening of. How can we not understand that the most important data to open are those that enable citizens, businesses and government to generate economic and social value? […] How many GDP percentage points do we gain by live streaming the meetings of the parliamentary commissions? The purpose of open data is mainly to stimulate economic growth. We can do so by releasing data that are amenable to being used for building value added services rather than government transparency data. 1 is the point debated by Mozorov. It comes down to what your values are. Let me leave it at that for now – I’ll come to it in a moment. 2 is definitely false – in the scientific sense of being contradicted by a veritable tide of economic literature. In the case of Italy, Corte dei Conti, our top administrative tribunal, estimates that corruption costs 60 billion euro a year. A few years ago this paper was quite popular (and there are many others). It says: increasing corruption by 1% (measured by polling indicators: corruption is by definition elusive to measure “at the tap”) implies a decrease of the GDP’s growth rate by a bit more than half a percentage point. Over the years, obviously, foregone growth itself follows an exponential growth curve – compound interest is an ugly beast – so that even small differences in the levels of corruption can lead to large ones in the absolute levels of national wealth. In the following chart I imagine two initially identical economies (GDP at time 0 = 100), which would each grow by 2% a year in the absence of changes in their levels of corruption. 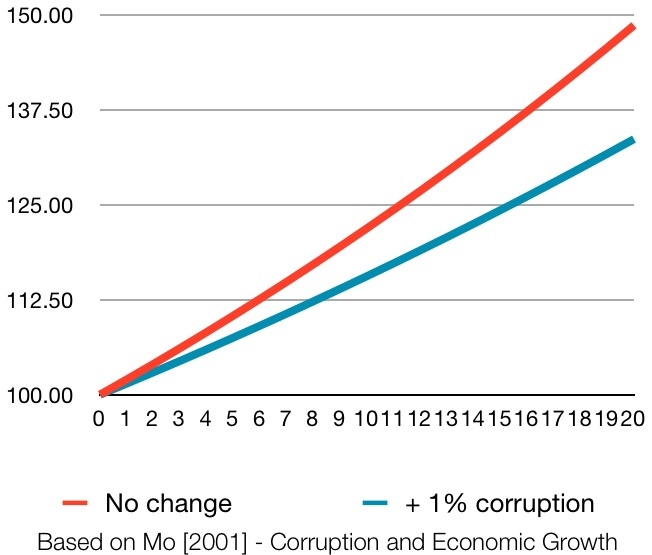 I then posit that one of the two experiences a 1% increase in the levels of corruption in year 1. Following Mo, 2001 quoted above, this decreases its rate of growth by 0.54 percentage points. Corruption levels and everything else remain stable thereafter. Twenty years later, the GDP of the more virtuous economy has a fifteen percentage points lead on the less virtuous one. Not by chance, the World Bank, OECD, UNDP and every other development agency worth its salt is turning an increasingly interested eye to pro-transparency, anti-corruption policies. Nor is it just corruption: the combination of open data, a lively data journalism scene and an attentive public opinion can help improve the effectiveness of public spending executed legally but poorly, that follows the same mathematical logic in decreasing growth. This is the rationale behind projects like Opencoesione (public expenditure data on over 600,000 projects funded with regional cohesion funds). Remember Linus’s Law: given enough eyeballs, all bugs are shallow. Now, open data are not only a component of transparency; my experience (and, I think I can say, the Italian community’s – just look at Spaghetti Open Data) is that they generate additional demand for transparency, drive to better understand, order in the data generation and in the policy process. Conclusion: we, the open government/open data community, can disagree about our value system. But in practical terms, value systems does not make a lot of difference: we should all support radical transparency policies. If you agree with Mozorov, you will do it because you think we all have a right to know in depth what the government (and, hopefully in the near future, corporates) is doing, since that impacts our lives. If you agree with Vianello, you’ll do it because it’s good for GDP. Either way, the economic impact of open data has a tried and true channel for economic impact via increased efficiency in the overall economy from transparency; it’s there and it is solid. At the time of writing, it looks far more solid than impact via jobs created by startups that sell apps on Apple’s AppStore or Google’s Play. This entry was posted in Open government and tagged Evgeny Mozorov, open data, Opencoesione, trasparency, trasparenza on 9 May 2013 by Alberto. I’ve got a new task. I will run a new project called OpenPompei. 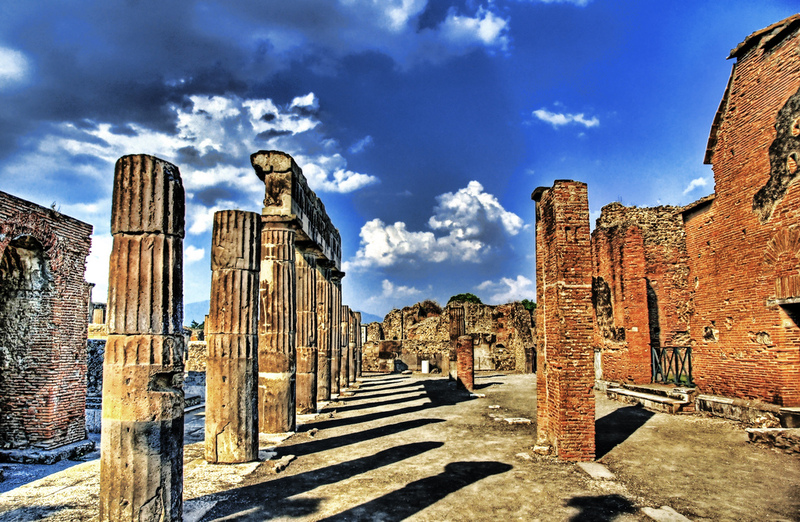 It is part of the government’s new strategy in the Naples area, and in particular Pompeii. Here’s the background: by the end of 2011 the government was convinced that the battle for the rule of law and a decent life for all in Italy’s Mezzogiorno would be won or lost in Pompeii, a symbol of the battle itself. In a very short time, three ministers – culture, interior and regional cohesion) set up a hundred-million euro project to restore the insulae damaged by the rain (a scourge of all open-air archaeological sites); got the European Commission’s seal of approval; wrapped it into an advanced security model that should keep mob-polluted companies to win any tenders. Thus was born the Great Pompeii Project. As a very minor integration of this massive project, the government decided in 2012 to launch a small initiative for transparency, inquiry and mobilization. Spending on culture is great; protecting that spending against criminal infiltration is even better; but neither is enough. Public spending must be not just legitimate, but effective and efficient. It was decided that releasing the spending data from the Great Pompeii project must be a step in the right direction. Access to data and data-powered public debate can help to discover errors suggest improvements, drive administrations to perform better. promoting a culture of transparency and open data of a large area, of which Pompeii is the symbolic center. The idea is to have a small team ready to help southern administrations that wish to try their hand at open data policies. We shall start, obviously, from the data of the Great Pompeii Project. reconnoitering and investigating the area’s hacker economy. As all densely populated places, the Naples area is full of co-working spaces, new digital companies, social enterprises, social innovators, sharing economy types. As everywhere, these initiatives are often fragile and isolated, but embody an idea of the future. Our ambition is to get to meet them, find out more about their goals, struggles and successes, and – if possibile – get their voice into the public policy debate, with no ambition to solve every problem. The dream behind OpenPompei is to help build an alliance of civic hackers, non-compromised enterprises and State to maintain a high level of attention on public spending, so as to fight corruption and increase efficiency. It is unlikely for a small, peripheral project to achieve such a lofty goal, but we hope to give a contribution – at least one of knowledge. To guarantee its independence, OpenPompai was set up as a European-funded project. 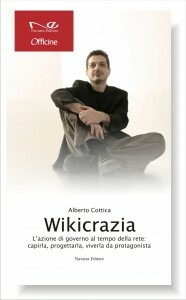 Studiare Sviluppo, a in-house company of the ministry of the economy, was tasked with delivering. I worked with them before on Visioni Urbane e di Kublai. Wish me well, and be there for me when the going gets rough, ok? This entry was posted in industrie creative e sviluppo, social innovation, Wikicrazia and tagged #opendata, economia, Fabrizio Barca, hacker economy, mezzogiorno, open data, OpnePompei, Pompeii, sharing economy, social enterprise, social innovation, transparency, trasparenza on 2 May 2013 by Alberto.